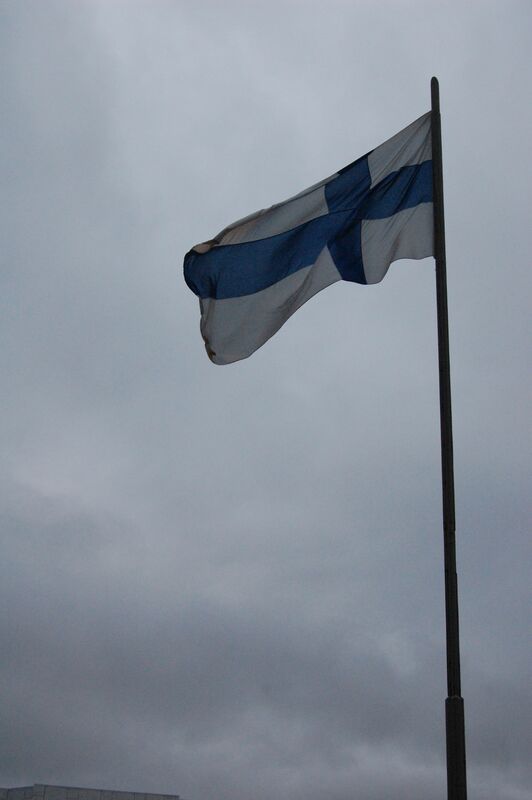 This past Sunday, December 6, was Independence Day in Finland, marking the 92nd year that Finland has been free from both Russian and Swedish rule (for a brief history, click here). It was the first Finnish holiday I have gotten to celebrate in Helsinki. One of the most central Independence Day traditions in Finland is for the student unions to march, torches in hand and white caps on head, to Senate Square. where speeches are given and a choir sings patriotic songs. In the dark, chilly winter air, it’s quite a beautiful scene. My friend Melanie and I were walking towards Senate Square for the festivities and coincided with the student procession. Lo and behold, we spotted our other friend, Erika, marching with members of her orchestra (students–and Erika is a visiting student at the University). Melanie and I played the roles of embarrassing parents, waving to her and taking pictures and being all around too excited. I could get a little offended by this (shall I write ULKOMAALAINEN [foreigner] in big letters on my forehead for you?) and write an essay discussing the cultural politics and theory of how one transplanted from another country or culture can–or can’t–embrace and celebrate another’s traditions and celebrations. But I think I’ll leave that for another day. Instead, I will imagine what it would be like to be in the reverse situation. Imagine me, decked out in my red white and blue finest with tacky patriotic sunglasses, sitting at a barbeque and eating a cheeseburger and star-spangled Jell-O from a paper plate as I watch the balloons, streamers, Cub Scout Troops, Veteran’s bands, and Irish Step Dancers of the Oreland 4th of July Parade pass in front of me (oh, and I’m getting sunburned as this happens. And there’s probably some epic ’80s pop music going on in the background). If there were some random people hanging around, speaking some other language and getting way too excited, I might be a little snarky about it too. But then, this imaginary scene is in small-town Pennsylvania, where we don’t get so many ulkomaalaisiin [foreigners, plural], or even people from the next town over, and also a place I’m all-around snarky about to begin with. I reimagine a scene somewhere else I’ve lived–Boston, perhaps–and I don’t see myself reacting the same way. Perhaps it’s because being from the U.S., we are taught that nobody is really “from” the U.S. We’re supposed to love the idea of ulkomaalaisiin coming to our country, being identifying with our dreams and aspirations as a nation. We call ourselves a “nation of immigrants”; we have an ideal that Americans are Americans because they want to be (of course, a past of slavery and the disrespect for Native American nations make this historically questionable, but that doesn’t stop us from mythologizing it). Finland isn’t like that, though. Finns have been in Finland for thousands of years, and they were ruled by Sweden, then Russia, but they have always been Finns. Finnish language, and Finnish culture, is a big deal—and while things were going well for a while, the Finns wanted to be independent from Russia because its autonomy (read: identity) was starting to be threatened a little too much. When the U.S. was fighting for independence, we didn’t refer to our unique language or national epic Kalevala because we didn’t have them (and Nationalism wasn’t really big yet). Truth is, I’m a bit of a sucker for the American concept of and idealistically united country. I like the idea that a country is made up of–or at least, was started by–ideas that we share, and yeah, it probably never truly existed and it probably never will, and we’ll fight until the end of time about what will make that “more perfect union” and we’ll be, frankly, broken, but for some reason I’m inspired (if not also seriously confused and sometimes annoyed) by the fact that we can still be a country in spite of it all. And I’m inspired by Finland too. I love the respect everyone shows for personal space, and I love the appreciation of quiet and the reliability that Finns show. I love the idea of sisu [roughly, ‘guts’–a word used to describe a sense of tough endurance and grace under pressure]. So, American that I am, this is why I care about Finnish Independence Day. For your viewing pleasure, see below, the opening scene to “The Unknown Soldier,” played every Independence Day on Finnish TV and accompanied by Sibelius’s Finlandia.